Scoots are simple, durable wooden vehicles great for toddlers and sized perfectly for playmats. Crafted from locally sourced, responsibly harvested pine with hardwood wheels, each Scoot measures approximately 2-5/8" tall by 4" wide by 2-1/8" thick. 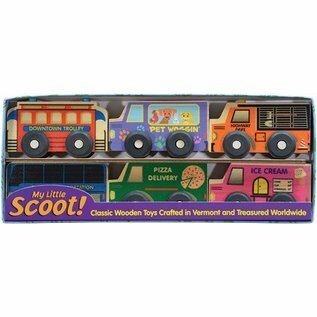 Scoot Box Set 2 includes six favorite vehicles: Highway Construction, Ice Cream, Pet Waggin', Public Transportation, Downtown Trolley, and Pizza Delivery. Perfect for a play mat or in the car.